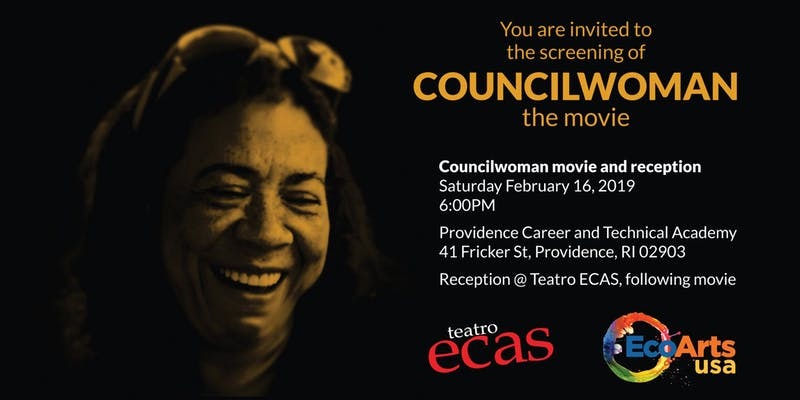 Hosted by Teatro ECAS and ECOArts USA, this Providence, RI premier of “Councilwoman” will offer local audiences a chance to watch this documentary film about Councilwoman Carmen Castillo. Politicians aren’t often full-time hotel housekeepers, grandmothers, and immigrants working service jobs. But Carmen Castillo changes that when she wins a seat on the City Council in Providence, Rhode Island. Carmen Castillo is a Dominican City Councilwoman who maintains her job cleaning hotel rooms, as she takes on her new role in politics. She faces skeptics who say she doesn’t have the education to govern, the power of corporate interests who take a stand against her fight for a $15/hourly wage in the City, and a tough re-election against two contenders—all of this while balancing the challenges of managing a full-time job cleaning hotel rooms, and a personal relationship. It’s a journey behind the scenes of politics after the victory. “Councilwoman” was supported by grants from the Rhode Island Council for the Humanities in 2012 (mini), and in 2014 and 2015 (major) – totaling $20,000.